Tool Daily is committed to providing more efficient and safer garden management tools for the rest of the world, helping people reducing the tiredness of spraying and cleaning of their garden. Universal pressure washer accessories fit most leading brands such as Karcher, Sun Joe, Honda, Generac, Simpson, Campbell, Greenworks, Homelite, Troybilt, Ryobi etc. No matter it is electric or gas pressure washer. 1.Set of 5 angles of 1/4" pressure washer tips: meet your need in different situations, such as watering flowers and plants, washing car and Clean hard-to-reach areas etc. Material: PA66 nozzle cover, stainless steel 304 and brass tips. 2.Set of 2 1/4" Rinse and Soap Nozzle provides a JET STREAM that reaches farther than standard spray tips. Material: PA66 nozzle cover, stainless steel 304 and brass tips. 3.The pivoting coupler adjusts 90 degrees for 3 different cleaning angles. It connects between 1/4" pressure washer wand and 1/4" high-pressure nozzle tips. Use on most pressure washers up to 4,500 PSI. Ideals for reaching up under the bottom of your car and also in the hard to reach areas in cars rims, also great for gutter cleaning. Material: stainless steel 304 and copper 62. Serious injury will be occur while spray at human body with high pressure, please keep away from human body and children. ★The universal pressure washer accessories include 7 Spray Nozzle Tips + 90 Degree Quick Connecting Pivoting Coupler, which are compatible with high pressure washer wands of the known brands that support up to 4,500 PSI. 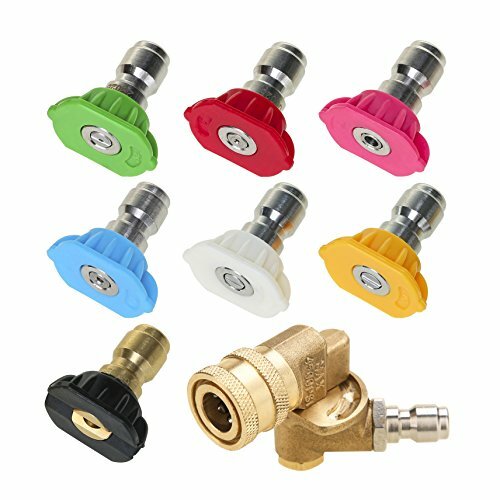 ★Include 1 Red Stainless Steel Nozzle Tip (0 Degree), 1 Yellow Stainless Steel Nozzle Tip (15 Degree), 1 Green Stainless Steel Nozzle Tip (25 Degree), 1 White Stainless Steel Nozzle Tip (40 Degree), 1 Brass soap nozzle tip (65 Degree), which meet different situations, such as watering flowers and plants, washing car and Clean hard-to-reach areas etc. ★Includes a piece of quick connect Pivoting Coupler to connect between the 1/4" wand and nozzle tips. Adjusts 90 degree for 3 different cleaning angles to get hard to reach areas, great for reaching up under the bottom of your car and also in the hard to reach areas in my cars rims, also great for gutter cleaning. ★Include extra Rinse and Soap Nozzle tips, provides a JET STREAM that reaches farther than standard spray tips. ★SATISFACTION GUARANTEED: Tool Daily is committed to make your work more efficient and safer. We are confident in the quality of our product and give you 2 YEARS WARRANTY and quick reply within 10 hours. Click "BUY IT NOW" and ENJOY QUALITY OF TOOL DAILY KIT. If you have any questions about this product by Tool Daily, contact us by completing and submitting the form below. If you are looking for a specif part number, please include it with your message.